Boss Snowplow expanded its snow and ice removal arsenal with SK-R rubber edge box plows for skid-steers, V-plow accessories and the stainless steel XT Plow. The SK-R box plow is available in 8- and 10-foot options with an optional backdrag edge accessory and offers a tough and durable rubber edge. Articulating, heavy-duty wing shoes to maintain pavement contact on uneven surfaces and provide superior wear resistance. Boss is also now offering urethane cutting edges for its 7-foot, 6-inch; 8-foot, 2-inch; and 9-foot, 2-inch XT V-plows. The V-plow cutting edges feature built-in curb guards and a patented snow catcher. 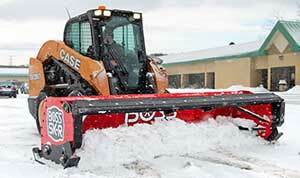 The edges offer optimum scraping performance for sensitive plowing surfaces, according to Boss. A backdrag edge kit is also available as an optional accessory. Boss also added the Boss XT plow, now available in 8-foot, 2-inch; and 9-foot, 2-inch stainless steel models. It features flared blade wings and an enhanced curl design, according to Boss. Contractors can also increase the blade width on a stainless steel plow by a full 22 inches at a 30-degree angle with the stainless steel wings. The wings can attach and detach within seconds. Boss’ new hopper and drive terrain for the Forge 1.0 and 1.5 spreaders is also made of stainless steel. The hopper is constructed with a combination of bolting, riveting and welding for optimal durability and serviceability throughout a spreader’s lifetime—allowing for maintenance and replacement of individual parts rather than the entire unit, Boss said.